You are here: Home / Destinations / Caribbean / Sharing is Caring…. Let’s face it, we do a lot of what most people would call “extreme” sports. We mountain bike, whitewater kayak, compete in off road triathlons and do as many adventure races as possible. Generally if there is an adventure sport/activity out there we want to try it. For one reason or another, neither of us had ever tried SCUBA diving. Not exactly a sport, but certainly an adventure. I have a hard time snorkeling, really who likes to breath through a straw, so when we inquired about taking classes in DC last fall I was needless to say, thrilled when it turned out to be too expensive. However that was not the case in Honduras and after almost every traveler we met moving north or south was going or had been to the Bay Islands we felt compelled to include it in our journey. I’ll be completely honest with you, we only learned how to SCUBA dive because we were in Honduras and it is the cheapest place in the world to become certified. 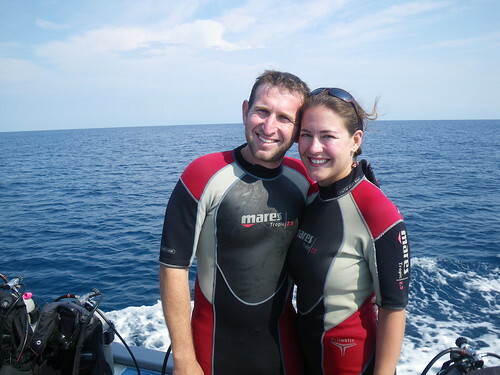 We figured that since we’re traveling around the world, we might as well get certified since showing up at the Great Barrier Reef and not being able to dive would just be lame. (Although I later found out that Australia is full of sharks.) Plus, this trip is all about new experiences. Therefore, we headed off to the Bay Islands of Honduras for a PADI Open Water Course. At the recommendation of our friends Tracy and David (two years around the world themselves!) we signed up for PADI Open Water Certification at Underwater Vision on the island of Utila. Thrown into the reading right away, we read the part about sharing air with your diving buddy and well, we were glad to have each other as buddies. Admittedly I did not share well in Kindergarten, or in 4th grade, especially when it came to Barbies, but its been a long time since then and I can safely say I would share my air with Danny, even if he never shares his ice cream with me! An hour into our confined water dive I was shivering 3m down practicing how to clear my mask and share my air. 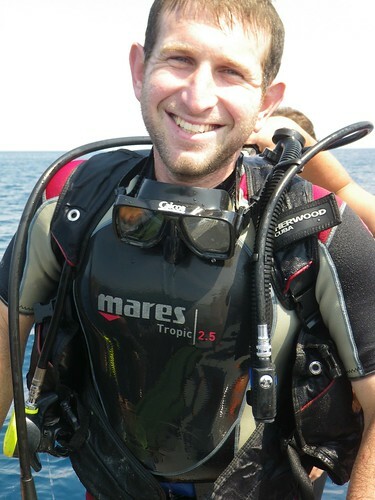 Needless to say the heavy equipment and dry air, coupled with the temperature underwater and extremely low visibility made for a lousy first diving experience. The next day, 30 minutes into my first open water dive I was 12m down staring into the home of a lobster surrounded by coral and big tropical fish. It was about 180 degrees away from the confined water dive and I felt like I was in a deep sea aquarium. The feeling of breathing underwater was surreal, I didn’t even notice how deep I was until I looked to the surface. Over the next five dives (we did a few fun dives as well after our certification), we swam in what seemed like an endless aquarium of tropical fish, coral and even some wrecks. We learned the unofficial rule of wetsuits, “don’t pee in a wetsuit, especially one that isn’t yours” and how to gracefully, if somewhat awkwardly get in and out of a tight wetsuit. Although I have nothing to compare it to, the diving around Utila was incredible. Excellent visibility (except for the first day) and nothing but beautiful coral reefs, blue water and thousands of marine creatures. We saw entire schools of fish and even swam with a sea turtle! Unfortunately our timing did not coincide with Utila’s famous whale sharks and there were no sightings of manta rays or other large marine animals. Swimming underwater with all the marine life I felt a little like Ariel (sans the red hair, but with the sidekick) from the Little Mermaid and I’ll admit that I sang “Under the sea” into my regulator more than a few times. Maybe that’s why I was having buoyancy issues! So now that we’re certified to dive, who is coming with us under the sea? I hear you can dive with Penguins in South America…. Welcome to the world of diving!! Now, try and get a night dive in when you can — its awesome. Sharing is now one of your strong points!!!! Or, at least sharing all of your wonderful experiences. 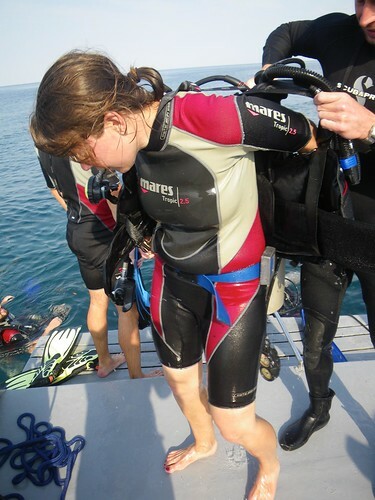 You make me want to get PADI SCUBA certified so I can join you… ” Under the Sea”. Maybe at the Great Barrier Reef? there’s actually a good chance that my lazy behind will be certified in scuba at some point, probably by force of my sister. also, we were sorta interested in roatan for our honeymoon (all dolphins, all the time!!) did you guys visit there before the quake? i’m very glad you’re both OK. silly east coast schools not teaching what to do. miss you both 🙂 much love. So many people interested in getting PADI certified!!!! Didn´t make it to Roatan unfornutately but we hear nothing but good things about it. Utila is the place to go for certification because it is cheaper but we hear Roatan is a much nicer place…both in terms of the beaches and the accomodations.